Rumbling Falls Cave is situated in central Tennessee under the Dry Fork Creek addition to Fall Creek Falls State Park. It is truly one of the finest caves in the South. 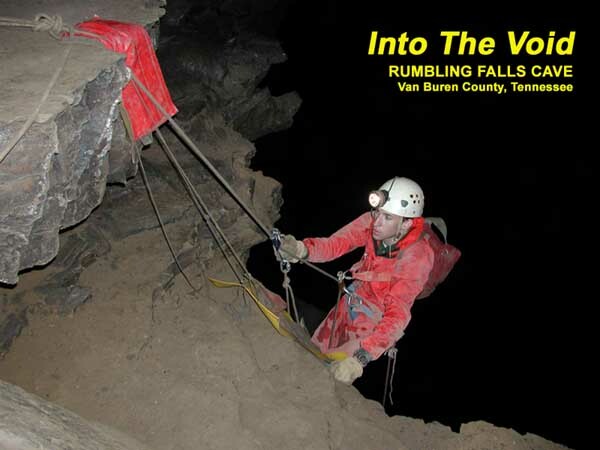 At nearly 15 miles in length, it contains huge river passages, sporting waterfall climbs, and Stupendous Pit. The latter drops down over 200 feet into the Rumble Room, a mammoth chamber measuring some five acres in area. Beyond this immense room lay miles of river passage stretching under Spencer Mountain, Turkey Cot Cove, and Millstone Branch. Rumbling Falls Cave is home to an is an extremely rich and diverse cave fauna, and many groups are combining efforts to help protect it. To date, the sampling of cave fauna includes nearly 20 species of troglobites, including several undescribed and very rare species, plus very large numbers of blind crayfishes and blind cavefishes. This is turning out to be one of the richest cave biotic environments in eastern North America. Currently there are plans for the operation of a $6.5 million municipal sewage treatment plant near the cave that will dump over 70,000 gallons of effluent a day into Dry Fork Creek. Dry Fork Creek flows past Spencer, Tennessee, through Rumbling Falls Cave, and then into Fall Creek Falls State Park (which is a protected Class II natural area). This risks not only damage to this cave and its biota, but the park itself. During summer months, it is believed that most of the flow in Dry Fork Creek will be effluent from the sewage plant! And even high tech, state of the art sewage plants can fail with horrible results. Several organizations are pursuing litigation to stop the discharge of wastewater into Dry Fork Creek. The Tennessee Environmental Council (TEC) and the Nashville Grotto, among others, are spearheading this. UPDATE! February 28, 2002- Tennessee Chancellor Ellen Hobbs Lyle approved a request by environmental groups to bar the discharge of sewage effluent into the Rumbling Falls Cave System. This delay remains in effect through May 23, giving groups time to find funding that can pay for a diversion of the effluent elsewhere, keeping it out of the cave system. Environmental groups also had to post a $15,000 bond to cover the three months of interest payments Spencer would have to pay on the loans taken to build the plant. Judge Lyle further complained the states permitting process for the plant was substantially flawed by incorrect procedure and application. (Nashville, TN, April 26, 2002) Two months after Chancellor Ellen Lyle ordered a stay to prevent operation of the Spencer sewage treatment plant a settlement has been reached to prevent discharge of treated wastewater into the protected Dry Fork Creek in Van Buren County, TN. The stream and the underlying cave system, Rumbling Falls, have been at the center of a battle regarding wastewater discharge and the protection of Tennessee’s natural resources. The agreement reached between environmental groups, the State of Tennessee and the City of Spencer prevents any discharge to Dry Fork Creek and requires the State to hold mandatory meetings with the environmental coalition during the next 90 days to craft changes to rules and procedures administered by the Tennessee Department of Environment and Conservation. The meetings will focus on public participation during the environmental review process and improvements in the classification and protection of streams throughout the state. “We’ve taken a step to protect high quality streams in this state from degradation. We think this agreement will change the way the state does business when it comes to discharging wastewater into streams,” added Daniel Boone, representing the Tennessee Scenic Rivers Association. Judge Barbara Haynes directed the mediated settlement. For the past two years numerous groups have joined the effort to protect Dry Fork Creek, including the Nashville Grotto, Public Employees for Environmental Responsibility, Sierra Club, Tennessee Environmental Council, Tennessee Scenic Rivers Association and the World Wildlife Fund.